Grace returns home for the first time in many years. She's inherited her father's ranch and has been given custody of her ten-year-old stepbrother JJ. She's never met him and doesn't know anything about him. The only person he has left to look after him is Noah, the man who broke Grace's heart. She's unpleasantly surprised when she finds him at the ranch, being in charge and taking care of everything. Grace has a successful and incredibly busy photography career in New York, how can she combine taking care of her brother with the life she leads? Noah is glad he has the chance to spend some time with Grace. He's missed her ever since he let her go. He thought he did the right thing, but hurt her in the process. Can he ever make things up to her? While JJ and Grace are getting to know each other, Noah knows he has to do something. He only has a short time to convince her the ranch is the place she should stay. Can he change Grace's mind and would it be possible to make her see how much he cares. He knows she still has feelings for him, so he has to carefully plan his actions if he wants her to give him another chance. Can he break down her walls? No Cowboy Required is an emotional love story. Grace left her home in sadness. Noah broke up with her and her father kept showing her she wasn't enough. The ranch holds some happy memories, but also a lot of bad ones and it isn't easy for Grace to stay there. JJ is a sweetheart and he instantly connects with his sister, but if Grace takes him with her to New York he will have to leave the few beloved things he has left. He's already suffered a great deal and starting somewhere else might not be something he can handle. It was interesting to see what Grace would decide. There's a constant battle between her heart and mind and each time she thinks she's come up with a good solution, someone gives her news that forces her to make new plans. She's a strong woman, who's in a difficult situation and I admired her courage and determination. Grace has a lot to lose, but she can also gain something precious, real love. I couldn't turn the pages quickly enough to find out what she'd receive. JoAnn Sky has written a moving romantic story. I was impressed by the intensity of every single feeling she writes about and she kept surprising me with unexpected twists and turns. No Cowboy Required is a love story with plenty of emotional layers. Doing what feels right, making difficult decisions and having to make sacrifices either way are topics that can make a story heavy, but due to JJ's heartwarming personality there's a great balance between dark and light in No Cowboy Required. I read this beautiful story with tears in my eyes and a big smile on my face in the end. If you like emotional stories about second chances in love you don't want to miss No Cowboy Required. 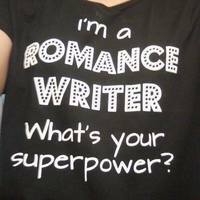 She is a two-time Golden Heart® finalist and a member of Romance Writers of America and its YARWA and Golden Network chapters. Originally from the Midwest, JoAnn currently lives in northern Nevada with her husband a.k.a. love of her life, three teenage children, and three crazy rescue dogs. No Cowboy Required is her debut novel. Thank you so much for having me! I’m so excited to be here and share some of the inspiration for my debut, NO COWBOY REQUIRED, which released on May 14. It is a sweet contemporary romance based on Reno, Nevada—think Sweet Home Alabama meets Raising Helen! Reno is known for its wild horses, and bands of wild horses visit our neighborhood. They are regularly eating the grass in the park behind our house, walking down the street, in open fields, and sometimes even in the neighbors' yards (depending on the type of grass they have -- the horses are picky about their grass, apparently). We've learned from neighbors and our own research that there is one stallion in each band and several mares (kind of like a harem). One of the mares is the “lead mare” and decides where the band goes for the day, leading the horses in a single-file line to that location. The single stallion stays in the back of the line; his job is to protect the band. When the colts (the young males) get of a certain age, they break off from the band (as there can only be one stallion), and they form their own band by stealing away/convincing a mare to leave. Several years ago, a particular band of horses decided they liked our neighborhood and basically took up residence. We’d see them almost daily grazing in the park behind our house or in one of the several open fields in close proximity. A certain horse caught my kids’ attention, a horse we named "Socks," since it was all black with 4 white feet. Socks was a young-ish male who hung near the band but never was "in" it; he was always just a bit away. Maybe he was trying to convince a mare to come with him, or maybe he was just trying to be part of the band but didn’t know how—we aren’t sure. We just know that several times we witnessed the lead mare discipline Socks as he tried to interact with the rest of the band. The mare would neigh, nip toward him and chase him a bit away, as if yelling at him. Every time the horses were out, I looked for Socks, watched the interaction, and rooted for this horse who didn’t seem to be able to break the equine social code. It reminded me of my son who, with high-functioning autism, didn’t understand the unwritten rules of middle school social norms. My son had a tough time making friends; it broke my heart. This is probably why watching Socks struggle tugged at my heart strings. Over the course of that spring and summer, the idea for weaving these elements into my next story was born. In NO COWBOY RQUIRED, the heroine’s pre-teen stepbrother, who has high-functioning autism, likes to sit, watch and draw the wild horses out in the fields. The interaction between the horses builds, as does their emotional significance, throughout the story in parallel to the romance arc between hero and heroine develops. At least, that’s the intent! Now that you know what inspired some of the elements of NO COWBOY REQUIRED, I hope you enjoy it even more! 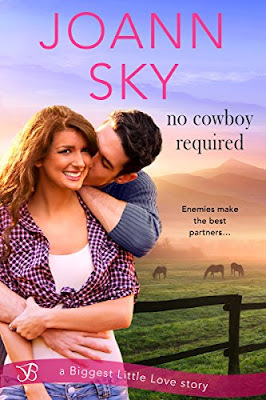 One very lucky reader of With Love for Books will receive a digital copy of No Cowboy Required by JoAnn Sky. No Cowboy Required sounds like an emotional story of forgiveness, second chances and finding peace. This certainly looks interesting and a great read! Thanks for the review! I really want to read this story. Nice review! It made me want to read this book! OOH sounds a great book of huge responsibility, coming home and second chances. Love the horses on the cover. Thanks for,the chance to win! I do hope 'Socks' got HIS happy ever after!